Several years ago, Firefox lost a lot of ground in the battle for browser market share when its developer, The Mozilla Foundation, let the browser grow fat and slow while chasing multiple dreams that never became reality (a mobile phone operating system, IoT services, creating a built-in video chat service, etc.). But the development team has returned to its roots, and the result is truly a quantum leap above previous Firefox versions. Firefox Quantum renders pages up to two times faster than the previous version, according to the company. A large chunk of this performance improvement is credited to Firefox’s new ability to take advantage of multi-core processors and a new CSS engine. My own subjective impression is that Quantum is roughly equal to Chrome in rendering speed now, and switching between tabs is much zippier, too. Firefox Quantum uses much less RAM than previous versions and certainly less than Chrome. The headline of a Mozilla blog post declares: "Firefox Quantum is super fast, while still conserving memory." You can see charts comparing the performance of Quantum to the previous version of Firefox. But curiously, they do not include any head-to-head comparisons of Quantum to Chrome, Edge, Internet Explorer, Opera, or Safari. Mozilla says "results will vary based on your computer and the apps you’re using," but my guess is that older and low-end machines will see the most performance gains with Firefox Quantum. Test results showed that Quantum used about 30% less RAM memory than Chrome on Windows, but slightly more than Chrome on a MacOS system. You can view the test results in the blog post linked above, and try the Speedometer benchmark test yourself, to see how the new Firefox performs, compared to the browser you have now. The user interface has also changed. Gone are the rounded corners on tabs and buttons, providing a much cleaner and modern look. It also renders better on high-dpi screens found on modern laptops and touchscreens. Firefox Quantum can still be customized to one’s heart’s content, from scratch or using skin templates available on the Mozilla site. Firefox Quantum still includes Pocket, which stores pages for offline reading, and the Reading Mode that strips extraneous content out of a page for easier concentration on the text. A handy instant-screenshot function is a nice addition. And of course, you can still use third-party extensions to add features and customize your 'Fox. Will it Reverse the Death Spiral? Is Firefox Quantum good enough to wrestle market share away from Chrome or Internet Explorer? I think it will entice only that small group of users who wistfully miss Firefox but switched to Chrome when Firefox became fat and slow. People who use many Google services such as GMail, Docs, Photos, Drive, etc., will stick with Chrome because it provides better integration with the services they love. It’s not so much the browser’s performance that dictates their choice, but what they can do with Chrome. However, Firefox Quantum may be able to slow the precipitous decline of Firefox’s market share, which currently stands at just under 13% (versus 22% a year ago). Market researchers at StatCounter have projected that Chrome will virtually obliterate Firefox and Internet Explorer by 2019; Quantum may push that death date out a bit. Quantum should also give Firefox a leg up over Safari, Opera, Edge, and other bit players. Firefox Quantum is still in Beta test mode, and will be released on November 14, 2017. You can download it now and take it for a spin, or sign up for updates by email. Look for the blue "Keep me updated" button at the bottom of the Firefox Quantum page. Most recent comments on "Firefox Quantum: Comeback or Flameout?" Installed the new Firefox late yesterday as soon as I read about it - faster, cleaner and I'll stay barring major glitches. Used FF from way back, tried others (Vivaldi, Opera, Chrome), don't like them. With Duck Duck Go, FF & AVG so far doing fine. Not a speed demon, hate changes just for sake of change - just simplify good features we already have & know. FF's reader plugin and print edit plugin are why I use FF. No other browser has those features (maybe IE?) that work. Not Chrome (I use Slimjet version), not Opera. And I don't use Microsoft's browsers. The only website I visit that doesn't render properly in FF is Cnet. With the reader plugin, only an article's pertinent info is displayed. Then it can be saved as a webpage. Print Edit does what it's name implies. Most anything can be removed from a webpage. Print size adjusted (which adjusts # of pages saved), and then webpage can be saved as a .pdf file or webpage file. And/or printed. My 2 cents. About a year ago(?) Firefox changed the layout, fonts and styles - without asking us. The headers and footers stopped showing on printouts. I never figured out how to fix these problems after many hours and days of research. Then, a few months ago, they stopped updating Firefox on XP machines. They couldn't care less. I've used Firefox and Mozilla from day-one, and have tolerated the bloat/slow/resource hog. Changing how the browser looked without any user input was extremely disrespectful. Trashing the Printout URL, dates... horrible problem when some users needed dates, times, etc...stamped on each page. But when they announced they no longer supported XP, well now we just wait day after day to be hacked. No money to buy new O/S's. Some folks have to work with what they have and be content. Sometimes Firefox gets so bogged down, it either crashes and closes or fails to load pages at all (have to keep Reloading). ATT DSL doesn't help. We might have old pcs but they are well-maintained, free of malware and updated by those programs that still take care of us old XP people. When I need to navigate faster and better, have to use Opera (although they quit XP a long time ago, at least they still do some sort of updates). When I need to print like normal with headers and footers, I use Opera, which has a very nice, user-friendly Print side window with options/settings. It's just old habit of using Firefox today while being tolerant of its problems. But we should've quit using it a long time ago. At least Opera is quicker. Just updated on both Dell XPS 8500 and Lenovo T470. It flys. Does everything I need to do with ease. What's up with this Speed Test? The screen blinks and boxes are checked... but where's the OUTPUT? I like it so far, but very disappointed Lastpass does not work. Perhaps in the final version? If not, back to Chrome. Quantum means very small. So quantum leap means a very small leap. Curious. I just dumped both Firefox and the Firefox-based Comodo IceDragon browsers and the Chrome-based Conmodo Dragon browser as well. All three ate up far to much memory. Now I have only Google Chrome and Microsoft Edge on my laptop. Before I dumped Firefox, Edge wouldn't work worth a spit -- worse than the Internet Explorer browser Edge was supposed to replace. Now Edge is working the way it should work -- although I'm still having problems downloading apps with it. I'll wait until the full version of Firefox Quantum is ready before I'll download it. Quantum is a memory pig! I installed it, used it for a while, found out the x32 version of Quantum was just a memory pig like the x64 veersion of Quantum, or the older x64 version of Firefox. So I went back to the older x32 version of Firefox, which is positively thrifty on memory. On a 2GB media center machine, I can open 30 pages with Firefox x32 before running out of memory. Using Quantum, I can open a total of 3 pages and I'm out of memory. I have no idea what people are rattling on about when they say Firefox is bloated or slow. I have used it for years and it is neither. The only things that have ever slowed it down have been poorly written add-ons. On the other hand I had to download Chrome to run some tests using an alternate browser, so I currently use both browsers, depending on what I want the browser to access. (a somewhat arbitrary process) but the point is that I use both concurrently on one PC. I find that Chrome is incredibly basic and has very few add-ons that actually assist my daily use. It's basic browser, whilst being perfectly OK is so basic that it's laughable. The actual configuration that a user can do is limited and every so often the three dots that you hit to customize the browser (and that's a joke in itself) vanish completely and the only way to adjust anything or reboot it is to crash it from Task Manager. The problem in the future seems to be FF's new version which renders most, if not all, add-ons inoperable. The implication there is that most of the existing add-ons would have to be completely re-written by the owners/programmers. I suspect that most won't bother and the enhanced configurability of FF, which is it's most attractive aspect, will vanish overnight. Have always been a full Firefox user. Never had any trouble with speed, it has always taken me where I needed/wanted to go. I received notification of the new release, not really bothered if it's faster or uses less memory. It has always worked for me. I will remain a true user and update as soon as the official release is available (testing half built, may disappoint me). Have in the past looked at opera, chrome and even the new Edge. They are either lacking in certain area's or over extreme (more than the average user needs or wants). I will stand by my best friend Firefox till the end! I used FireFox for years. Stopped when they decided that someone with conservative views should be fired from his job, even though there were no accusations that he ever treated anyone unfairly or disrespectfully. Using FireFox is supporting leftist fascism; it's really that simple. I just downloaded Quantum today and, if anything, it's worse than the crap Firefox I already had. Quantum seems to crash or freeze about 50% of the time, and I don't notice that it's any faster. To be honest, I haven't loved Firefox for at least the past two iterations, and I used to be a major fan. I guess it's Safari (blecch) for this girl from now on. Not sold on Chrome so far (and kind of tired of Google everything), so I guess we'll see. I had the upgrade to Quantum "forced" on to me a couple of days ago. Not impressed, as it freezes about half of the time I use it - it doesn't seem to be a task or web site related issue. I've been using Firefox since MS updated their browser a couple of years ago and that caused me problems... I guess I'm going to have to move on again unless there is a bug fix soon. I've been using Quantum for the last 3 days and it is WORSE than any other version, slow, lagging, static at times....a constant white loading page which you then if doesn't load up have to use task manager to close - barely workable with vids etc on pages -constant freezing and unresponsive pages - an atrocious browser. I'm am continually baffled by people claiming how much they 'love' the new firefox Quantum. I realize that peer pressure to get on the bandwagon is strong, but when you evaluate it objectively it really isn't an improvement. -When I was forced to install, it removed many of my settings. The menus changed and many features moved or where even removed. One was the option to save login usernames but not the password(for security). Now its all or nothing or configure it manually for each specific site. -With 16GB ram, I have never run out of memory before. Now I repeatedly run out of memory and even as I type this, I have 1 window with 10 tabs with mostly text and FF is using almost 3GB in strangely 6 instances(instead of 1)in process viewer. While I've been typing this, post a new FF process opened. -Finally, I think mozilla caved and drank the cool-aid. Because while user response has not been all that positive the internet news media keeps stating what victory FF-quantum is and 'give it a try', 'fast as chrome'. 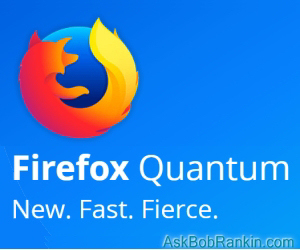 Firefox Quantum broke Theme, Font & Size Changer, the add-on that allowed visually impaired readers to change the font size of FF itself (menus, etc., not the fonts on web pages which are easy to change). I no longer can read Thunderbird or Firefox. So, reluctantly, after many years of using them, I've switched to Chrome and will drop Thunderbird as soon as I find a legible alternative. The new browser is developed to drop support for user extensions due all the internet crap and troubles starts all over again ! No extension or not supported extensions for the most needed task mostly user security and not loading all the crap posted on web pages ! With Quantum lack of everything, popups, cookie warnings and the list goes on ! Dropping support for user being on stear of web browsing not good for Firefox at all ! There's more reader feedback... See all 46 comments for this article.